The bankruptcy of Hannevind surprised many in the wind industry, as the Swedish firm was thought to provide a better quality product than many in the sector. Simon Maden, of Maden Design, who erected the faulty turbine, stated in the local press that, “It looks like the turbine’s break [sic] mechanisms failed. All parties decided a controlled collapse was the way to go. If we ever found ourselves in the same situation again I wouldn’t do anything differently. “Things were made more difficult by the fact the turbine manufacturers are no longer in business. We were only alerted to this recently and it meant we couldn’t go to them for any advice. I am satisfied the turbine was installed correctly and properly tested.” 2 1 ‘Hannevind Vindkraft AB’, Bloomberg Businessweek. 2 ‘Turbine brought down due to mechanical failure’, Berwick Advertiser, 18 December, 2011. 3 ‘Turbine installer Icon Energy hit by Proven collapse’, BBC News, 14 October 2011. 4 ‘Scots bid to keep Proven local as small wind faces sceptics’, Recharge News, 21 September, 2011. 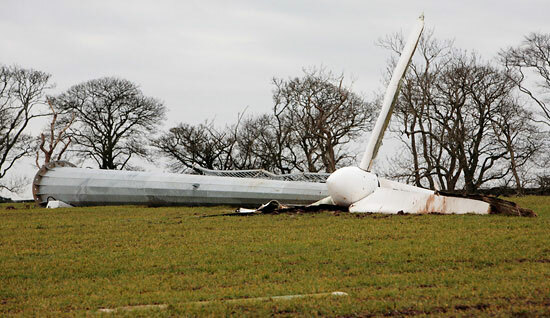 5 ‘Wind turbines ripped apart by gale force winds in Hudddersfield’, Huddersfield Daily Examiner, 6 January, 2012. 6 ‘More trouble with wind turbines’, Shropshire Star, 20 January, 2012. They are caused by gear oil failures in wind turbines. They occur because no gear oil has yet been invented to withstand the extreme pressures produced within these transmissions. The latest attempt to solve this problem has seen the US Government give Dow-Corning a big grant to work on a solution – the status of the project can be seen at www.nrel.gov/wind/pdfs/day3_sessionv_3_dowcorning_jungk.pdf It seems the solution is some years away it also shows that gear box failures are not uncommon (average one every 8 years). Even if they don’t result in spectacular fires like the one in Ardrossan in December – it is one too many.